Create a beautiful hand-printed card for Mother’s Day or to celebrate spring. Kids paint on yarn wrapped around cardboard to “print” onto white paper for both a card frame and the base of a flower picture. 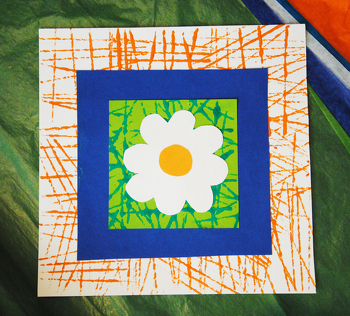 Flowers, stems and leaves are then cut out of colorful construction paper creating a colorful layered collage. Tape the end of the string on one side of a cardboard rectangle. Wind the string around and around the cardboard rectangle until you have lines of string covering the width of the cardboard. Leave space between the string for a more interesting print. Cut the string and tape it on the same side as the first piece of tape. 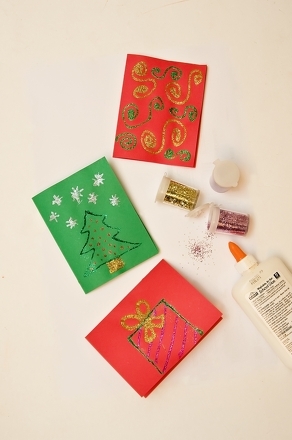 Paint the string on the side of the card without tape with a bright colored paint using a paintbrush. Stamp the wet, painted strings onto the white card. Print more lines on the card, adding more paint as you go. To add more colors to the print, wind new string around cardboard, Start a new cardboard wound with string for each colour. Allow the card to dry completely. Cut a square from one of the sheets of construction paper. It should be smaller than your card. Then, cut another square from a different colour construction paper that is smaller than the first square. Print strings onto the smallest square you cut out and allow it to dry. Glue the un-printed square in the centre of your card. Glue the small printed square in the centre of the solid square. Cut a flower head out of a piece of construction paper. It can be a tulip, daisy or any other flower you can imagine. Cut out a small circle for the centre. Glue the flower head onto the centre of the small printed square, and the centre dot in the middle. Write a message in your card to someone you love and brighten their day! If you have room on your card, you can cut out a stem and leaves from green construction paper to add to the flower. Or, you can make multiple flowers by cutting out more shapes from the construction paper. Indiana picked the pretty peony to be their official state flower. What flower would you choose if you were the official flower chooser of your state? Wouldn't you want to sniff this beautiful flower? The mountain laurel is the state flower of Connecticut. Can you child guess why the state choose this flower? The mountain laurel is a pretty popular flower. Both Pennsylvania and Connecticut choose it as their official state flower. Declare yourself Queen or King of Spring with this flower crown craft! The sego lily is the official state flower of Utah. Add some life to this pretty flower with your brightest crayons. Do you know how to pronounce South Dakota's state flower, the Pasque flower? Say hello to the blossoming Sagebrush, the official state flower of Nevada. Use your crayons to make this flower burst to life. Check out Iowa's favorite flower, the wild prairie rose! The people of Iowa liked it so much they made it their state flower. What's your favorite flower? Louisiana's favorite is the magnolia. colour in this flower and give it a background worthy of its pretty petals.